Fans of JUDY MOODY already know that Judy has a mood for every occasion—and this time Judy is in a jealous mood. Jealous of classmate Jessica Finch, that is, who gets her picture on the front page of the newspaper. When Judy sets off in pursuit of her own fame and happiness, watch out! She's so determined, she just might find it, or she might merely become more INFAMOUS than ever. Her latest adventures are sure to put readers in a very Judy Moody mood! Funny black-and-white cartoons appear throughout. Dialogue is right on target for the character's age and feelings. This sequel to JUDY MOODY handily matches the original in zip and wit...Even Judy could spell two words that describe both the plot and its heroine: f-r-e-s-h and f-u-n-n-y. Here's to her quick return. New chapter book readers will enjoy watching Judy's moods, and the ensuing complications, unfold. 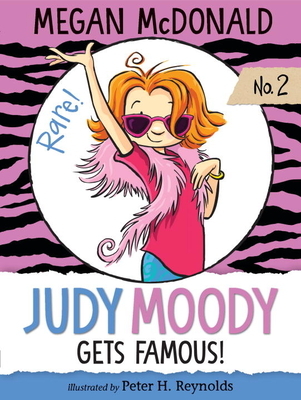 Everything about these Judy Moody books - from the liberally illustrated, spaciously designed, accessible format to the believability of Judy's third-grade worldview - spells G-O-O-D N-E-W-S for early chapter book readers.